Size of Male: 20-24 lbs., 15-16 in. Size of Female: 20-24 lbs., 15-16 in. There’s always been a spiritual ring to Tibet, and the Tibetan Terrier is no different. These “holy dogs” and luck magnets (and their alert, siren-like howls when sounding an alert) are sure to fascinate you and your loved ones. Whether inside your home or out in the open, this dog breed makes a devoted watch dog, companion and friend. The dogs trace their roots to more than 20 centuries back in Tibet’s “Lost Valley.” They were bred by Lamaist monks for companionship and for an occasional hand with chores. The pooches also proved to be excellent guards and retrievers for things that fell from the mountains. The Tibetan Terrier was never considered for commercial trade but was instead given freely as a good luck charm and gift to people whom the monks owed a debt of gratitude or friendship. Recognized in India in the early 1920s and in England by the late 1930s, the breed today holds true to its role as a mythical and multi-purpose companion. These dogs are only a terrier in size. The breed’s disposition is far from the spunky expectations that the terrier label suggests. In fact, the dogs are agreeable with other pets, gentle with children and charming all around. Their very temperament is their main selling point for both rookie and veteran pet owners alike. Living Environment – In general, Tibetan Terriers are indoor pets that could use some time out every now and then. This means that while the breed does tolerate apartment living, a home with a yard is the more optimal choice. There ought to be enough socialization opportunities in your space as well, as these are necessary to address separation anxiety issues in the breed. Grooming – Coat care literally demands a great deal of commitment from the serious dog owner. Without your help, your pet’s long coat could become a ball of mess in no time. This is a high-maintenance breed. At least 2 thorough brushings a week, regular clipping plus frequent trimming are required. Diet & Exercise – Are you up to the challenge of feeding a picky eater? If so, good luck with this dog breed. Your pet does know how to differentiate a tasty morsel from a bland one, but it’s your job to ensure that a correct and nutritious diet is served. The ideal meal for these dogs consists of horse meat and white rice. Food items to avoid include potatoes, fish and citrus fruits. Exercise is crucial to the breed’s well-being. Your pet has to vent its energy daily. Luckily, physical exertion can take many forms: supervised walks, vigorous play sessions and hiking excursions. So, pick one that suits your schedule and your dog’s varying needs. Health – Though long-lived and energetic, a host of health concerns can be linked to the breed – some of which include cataracts, lens and patellar luxation, canine hip dysplasia and thyroid problems. It is suggested that you have your pooch undergo hip and eye exams, as well as regular health checks. Dog training is on the easy side. Their eagerness to please and intelligence make teaching the Tibetan Terrier a breeze. This is somewhat offset by an occasional willful streak and an oversensitivity to heavy handed rebukes. If you wish to lord over the dog in the training department, then stay gentle but firm. Prior to the training proper itself, adequate socialization and exposure to basic dog obedience training is vital. 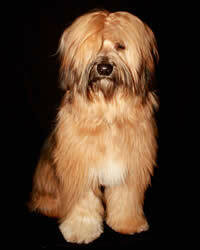 Welcome to the Gold and Brill Tibetan Terrier kennel website.